Video Converter is a good web tool and Chrome app that allows you to convert a wide range of media format to MP4, AVI, MPEG, FLV, 3GP. For teachers, this simple tool does serve the purpose, for those of you looking to convert video files bigger than 1023MB, Video Converter is definitely not an option. Video Convert is integrated with Google Drive so you can easily upload and convert videos you have saved on your Drive. 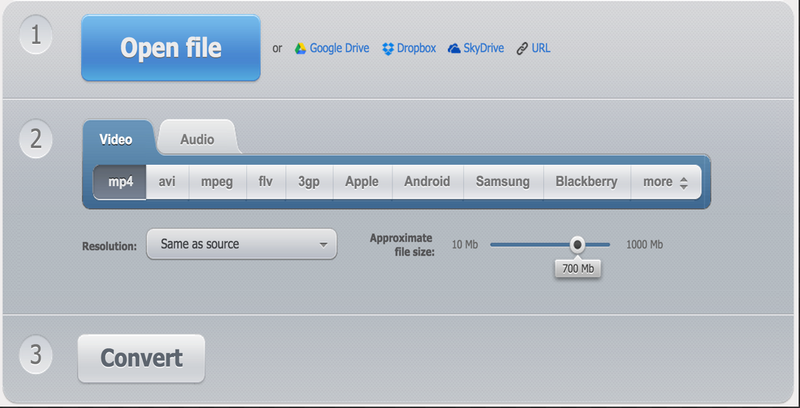 It is also integrated with other services namely Dropbox and SkyDrive. The process of converting a video is very simple: upload your video file from your computer or other integrated services. You can also use the URL of a video but this last option did not work for us with YouTube videos. After uploading your video, choose the format you want it converted to then click on convert. Depending on your Internet connection, the conversion process can sometimes take a bit longer than expected. Give it try and see if you like it.